There are many different kinds of gender gaps, including one in religion. In the U.S., for instance, women are more likely than men to say they attend worship services regularly – a trend consistent with many predominantly Christian countries around the world. But the U.S. gap in church attendance has been narrowing in recent decades as the share of women attending weekly has declined. Indeed, a Pew Research Center analysis of data from the General Social Survey (GSS) finds that between 1972 and 1974, an average of 36% of women and 26% of men reported attending religious services at least once a week – a 10-percentage-point gap. After initially widening to 13 points in the mid-1980s, the gap began to shrink in the late 1980s through the 1990s. 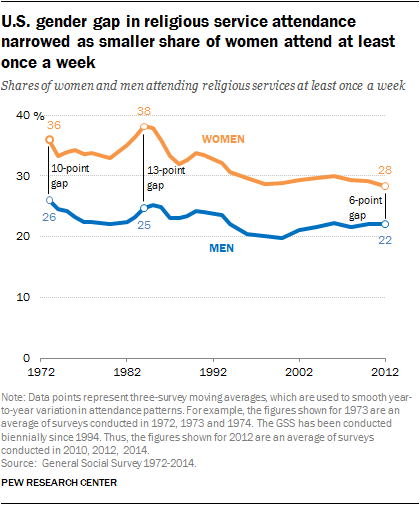 During this period, weekly attendance at religious services declined among all Americans, but it declined more among women than men. As a result, by the early 2010s, the gender gap in attendance had narrowed to just 6 points, with 28% of women and 22% of men saying they attend religious services at least weekly. Why is this happening? There are several theories that have been advanced to explain this trend, although they don’t always square with available data. One theory is that the decline in women’s attendance at services – and subsequent narrowing of the attendance gender gap – is connected to changes in women’s labor force participation. 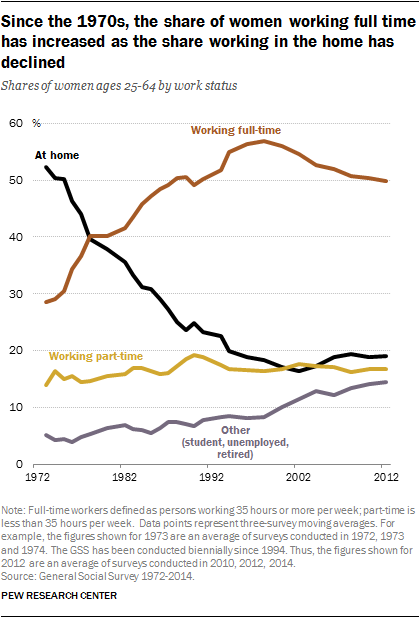 In the mid-1970s, three-in-ten U.S. women ages 25 to 64 were working full time in the labor force. Today, just over half of women in that age group work full time, compared with around 70% of men. Scholars have found that in the U.S. and other predominantly Christian countries, women working in the labor force attend religious services less often than women outside the labor force and show a smaller gender gap with men. However, it should be noted that the fastest increase in women’s full-time employment during this period occurred in the late 1970s and early 1980s, during which time the gender gap on religious service attendance actually widened somewhat. In the following years (mid 1980s through the late 1990s), the share of women working full time continued to increase and women’s worship attendance declined – but it did so for women inside and outside the labor force, and across occupational categories including managers, professionals and retail and service workers. Another theory that might explain religious service attendance trends points to the large gains in women’s educational attainment in recent decades. But college-educated and less-educated women attended religious services at similar rates and both experienced declines in recent decades. One factor that does play into the trends in religious attendance is the difference between those Americans who are affiliated with a religion and those who are not. Since the 1990s, the share of religiously unaffiliated adults, or religious “nones,” has more than doubled, growing from 8% in 1990 to 21% in 2014, according to GSS data. (Pew Research Center surveys have found slightly different figures, but the same general trend.) 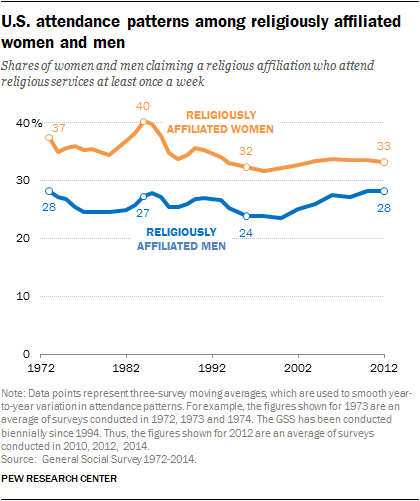 Although men are more likely than women to say they have no religious affiliation, the rate of growth in the unaffiliated has been slightly more rapid for women than men. This has helped narrow the gender gap in weekly attendance. But a more important factor in the narrowing attendance gap is found on the other side of the equation, among those adults who are affiliated with a religion.